Increase the number of people visiting the website. Aim to place well on search engines for phrases such as “poker mac hud” or “mac poker tracking software”. A good google ranking for lots of search terms is valuable. Getting on the first page of search results for many different search phrases is vital; being in position 1 is an order of magnitude better than position 2, and several orders better for position 10. Convince as many visitors as possible download the software. 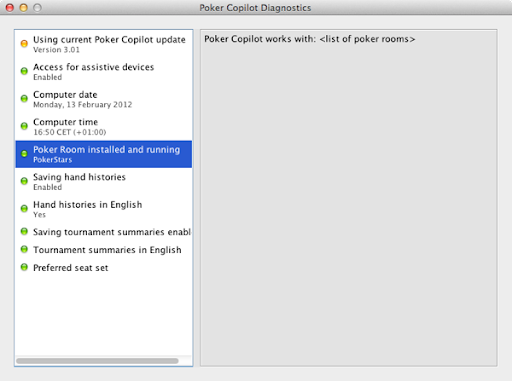 The sole purpose of the Poker Copilot home page is to persuade people to download the software. Make the software easy for first-time users to get running to the point that it gives them useful results. Make it so that people want to keep using it and will keep using it. Within the 30-day free period, get potential customers hooked. Help them realise the value of Poker Copilot. 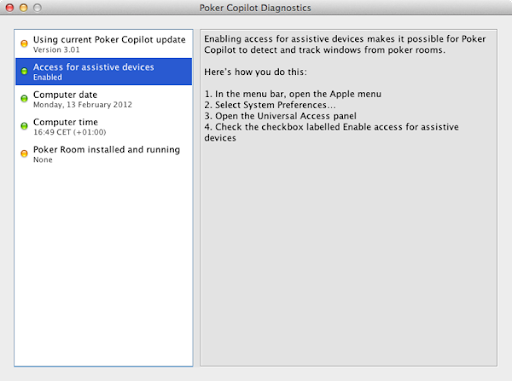 Make them sorely miss playing online poker on the Mac with Poker Copilot’s HUD, so that they decide to buy Poker Copilot. Make it as easy as possible to buy Poker Copilot. At the moment I’m concentrating on step 4. Some people have trouble getting Poker Copilot working properly. Almost every day I get emails from people saying, “help! Poker Copilot is not working”, and I help them solve the problem. 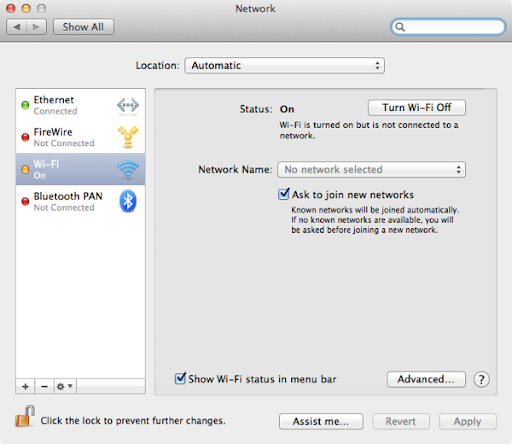 These problems will always happen because for Poker Copilot to work properly you need to configure your Mac correctly AND you need to configure your poker room software (such as PokerStars) correctly. Many people will give up quickly on downloaded software if they can’t get it working within a few minutes. My general software design philosophy is to find some excellent software that already solves a similar problem, and imitate their approach. So I’m using this screen as the inspiration for a new Poker Copilot diagnostics window. The manual help I’m giving people could be done more efficiently with well-designed software. This will get more people using Poker Copilot successfully. This will hopefully lead to less email support AND to more sales. The screen looks simple but actually hides a lot of complexity. And that is the point of it!